Staphylococcus epidermidis, a coagulase-negative Staphylococcus, is the most important pathogen responsible for chronic nosocomial infections. These bacteria produce extracellular slime and form biofilms on various biotic and abiotic surfaces. Bacterial biofilms are very resistant to standard antimicrobial therapy and difficult to eradicate, so it is important to search for new more effective anti-biofilm agents, for example in the group of natural substances. The aim of the study was to examine the activity of two ionophores – salinomycin and monensin against clinical S. epidermidis strains, using MIC/MBC method and biofilm formation inhibition assay. Bacterial strains were tested also for slime production using Congo Red Agar. Both tested ionophore antibiotics showed the highest activity against planktonic bacteria of clinical as well as standard S. epidermidis strains and effectively inhibited the formation of bacterial biofilm. Staphylococcus epidermidis belonging to coagulase-negative staphylococci, the regular component of human skin and mucous membranes, is a major cause of chronic nosocomial infections associated with implanted medical devices, i.e. vascular line, artificial heart valves, catheters, bone implants (Arciola et al., 2005; Montanaro et al., 2011). Multi-drug resistance strains, the most common reasons of nosocomial post-operative wound and bloodstream infections, create serious problems. S. epidermidis produce extracellular slime and are able to adhere to various surfaces (biotic and abiotic), as well as form biofilms (Christensen et al., 1982; Götz, 2002; Mack et al., 2006). Slime production and formation of biofilms have been considered as important S. epidermidis virulence factor in the development of biomaterials-related infections (Pascual, 2002; Podbielska et al., 2010). Biofilms are multicellular, three-dimensional structures composed of aggregates of microorganisms cells and the extracellular matrix, comprising polysaccharides, proteins, nucleic acids and water (Costerton et al., 1999). Bacteria in biofilm form are very difficult to eradicate and more resistant to the host immune response and standard antimicrobial agents, such as antibiotics, antiseptics and disinfectant than planktonic form (Bridier et al., 2011; Gomes et al., 2014; Høiby et al., 2010). Due to the problems in the treatment of biofilm-related infections, it is very urgent and important to search for new more effective anti-biofilm agents, e.g. in the group of natural substances. Recently, it has been found that this class of compounds might be also important as chemotherapeutic agents, especially against the proliferation of various cancer cells, including those displaying multi-drug resistance and against cancer stem cells (CSCs). It has been found that salinomycin and monensin exhibit high antimicrobial activity against Gram-positive bacteria, including mycobacteria and some filamentous fungi (Huczyński, 2012; Łowicki and Huczyński, 2013). Polyether skeletons of the pseudo-cyclic structure of polyether ionophores are able to form complexes with metal cations and facilitate their transport across cellular membranes, disrupting the Na+/K+ ion balance across cell membranes, which finally leads to death of a cell. Monensin and salinomycin derivatives such as esters and amides are also active against the strains of Gram-positive bacteria, including hospital S. aureus strains, i.e. methicillin-susceptible (MSSA) and methicillin-resistant S. aureus (MRSA) and S. epidermidis (MRSE) strains (Antoszczak et al., 2014; Łowicki et al., 2009). In this study antimicrobial activity of monensin and salinomycim against planktonic cells of clinical S. epidermidis strains as well as inhibition of bacterial biofilm formation by ionophores were investigated. Chemicals. Salinomycin was prepared conveniently by isolation of its sodium salt from commercially available veterinary premix – SACOX® following acidic extraction using the procedure described previously (Huczyński et al., 2012). The spectroscopic data of salinomycin were in agreement with previously published assignments (Huczyński et al., 2012). Monensin was purchased from Sigma-Aldrich. Bacterial strains. Twelve clinical S. epidermidis strains and two reference strains: S. epidermidis ATCC 12228 and S. epidermidis ATCC 35984 were used in this study. The clinical strains were isolated from blood of hospitalised patients. S. epidermidis ATCC 12228 was used in biofilm assay as a negative control (low biofilm-producer), S. epidermidis ATCC 35984 was used as positive control (high biofilm-producer). Microorganisms were obtained from the collection of Department of Pharmaceutical Microbiology, Medical University of Warsaw, Poland. Evaluation of minimal inhibitory concentration (MIC) and minimal bactericidal concentration (MBC) of tested compounds. The minimal concentrations of monensin, salinomycin and the reference antibacterial agent – ciprofloxacin (CIP), inhibiting growth of bacterial strains were determined by reference broth dilution methods using 96-well microtitre plates (Medlab Products), according to Clinical and Laboratory Standards Institute recommendation (CLSI, 2012a). Concentrations of tested compounds in Mueller-Hinton liquid medium (Beckton Dickinson) ranged from 0.0625 to 256 mg × ml-1, The final inoculum of all microorganisms studied was about 105 CFU/ml (colony forming units per ml). MICs values were estimated after 18 h incubation at 35°C. MBC values (99.9 % cells killing of the final inoculums) of the compounds were determined by subculturing 10 µl of suspension from each negative (no visible growth) well from the MIC assay, onto TSA plates (CLSI, 1999). The plates were incubated for 24 hours at 37°C. Detection of slime-production on Congo Red Agar. All S. epidermidis strains were tested for slime production on Congo Red Agar (CRA) according to Podbielska et al. (2010). The CRA medium was composed of 37 g/l BHI agar (bioMérieux) supplemented with 0.8 g/l of Congo red (Sigma) and 50 g/l sucrose (POCh). Bacteria from one colony were cultured on medium in two replicates. Plates were incubated for 24 h at 37°C and for 24 h at 20 °C in the dark. After incubation the color of bacterial colonies was assessed. S. epidermidis biofilm formation – MTT assay. S. epidermidis stains were cultured in Tryptone Soy Broth (BTL) supplemented with 0.5% glucose (POCh) for 24 h at 37°C. Bacterial culture was diluted 1:1 in fresh TSB-glucose to obtain a final concentration of approximately 107 CFU/ml. This suspension was transferred to wells of 96-well microdilution plates (Karell – Medlab, Italy). The medium TSB-glucose without bacteria was a negative control. The plates were incubated for 24 h at 37°C. After incubation, the contents of each well were removed and wells were washed with sterile phosphate buffered saline (PBS). Adherent bacteria in wells were stained with 3-(4,5-dimethyl-2-thiazolyl)-2,5 diphenyl-2H-tetrazolium bromide (MTT, Sigma; 0.5% in PBS). The plates were incubated for 2 hours at 37 °C. Adherent bacterial cells, which usually formed biofilm on wells surface, were uniformly stained with MTT. After incubation the solution was removed and bacterial biofilm was solubilized in DMSO (Merck) with glycine buffer (pH 10.2) and incubated for 15 minutes at room temperature. The absorbance was measured at 554 nm using spectrophotometer (Power Wave XS, BioTek). The experiments were performed in four replicates. Biofilm inhibition assay. Inhibition of bacterial biofilm formation was screened using modified method, described previously (Nagender et al., 2013). All tested S. epidermidis strains were cultured overnight in Tryptone Soy Broth supplemented with 0.5% glucose. The solutions of tested compounds in TSB-glucose medium were mixed (1:1) with the bacterial inocula (107 CFU/ml) in sterile 96-well polystyrene microtitre plates and incubated at 37°C for 24 h. The final concentrations of the tested compounds ranged from 1 to 32 µg/ml. The negative control was TSB-glucose medium, whereas the positive control was bacterial culture without tested compounds in TSB-glucose. After incubation medium was discarded from the wells and wells were washed twice with sterile phosphate buffered saline (PBS) to remove the non-adherent bacteria. Alive bacterial cells in each well of the microdilution plate were stained with MTT in PBS buffer for 2 hours at 37°C. After incubation, the solution was removed and the bacterial biofilm was solubilised in DMSO with glycine buffer and mixed for 15 minutes at room temperature. Biofilm absorbance was measured at 554 nm using a spectrophotometer. The biofilm-inhibition results were interpreted from dose (concentrations)-response graphs. All the experiments were carried out in quadruplicate. The antibiotic susceptibility of the bacterial strains was determined by the standard CLSI disk diffusion method (CLSI, 2012b) and automated manner by Vitek 2 system (bioMérieux). All clinical strains were resistant to methicillin (MRSE). Ten strains were also resistant to ciprofloxacin and two – to moxifloxacin. Eleven isolates presented MLSB phenotype (10 – constitutive and 1- inducible). Nine strains were resistant to gentamicin, four – to tetracycline and rifampicin, one – to fosfomycin and fusidic acid. All strains were susceptible to vancomycin and linezolid. The activities of tested compounds (salinomycin, monensin and reference antibacterial agent – ciprofloxacin) against planktonic (free-swimming) of clinical and standard S. epidermidis strains are listed in Table I. The salinomycin MIC values for planktonic cells ranged from 0.5 µg × ml-1 to 2.0 µg × ml-1, MBC values ranged from 4.0 to 32 µg × ml-1. Monensin was found to be active against tested strains, with MIC values ranging from 0.5 to 2.0 µg × ml-1 and MBC values ranged from 4 to 16 µg × ml-1. For the standard antimicrobial agent – ciprofloxacin MIC values ranged from 0.125 to 64 µg × ml-1 and MBC values ranged from 0.5 to > 256 µg × ml-1. Slime production by the tested S. epidermidis strains was assessed on the basis of the color of bacterial colonies on Congo Red Agar. 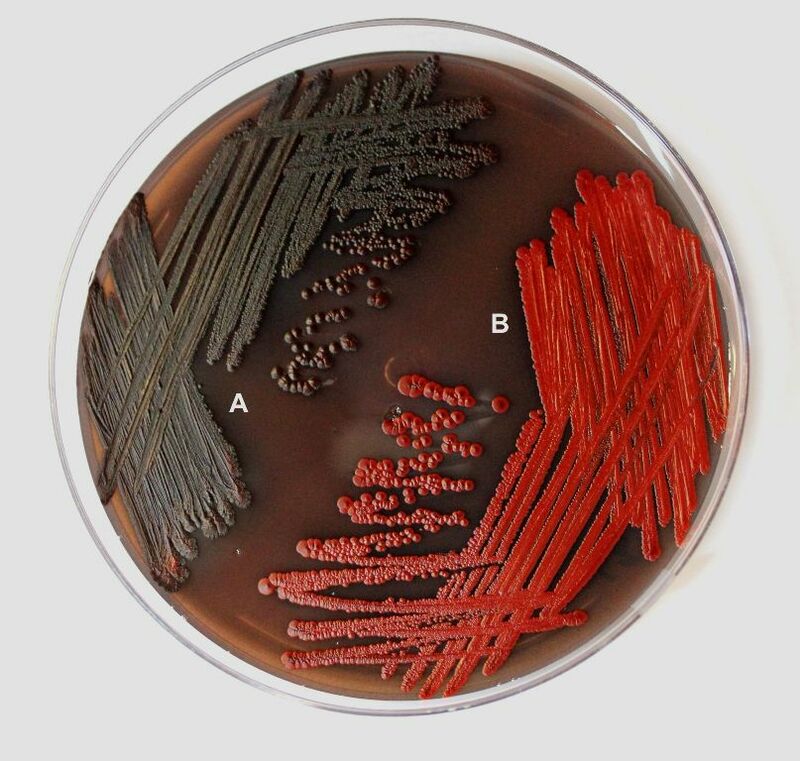 A black or brick-brown color of colonies were interpreted as slime-positive producing in contrast with red or pinkish-red colonies which were interpreted as slime-negative producing (Fig. 1). Fig. 1. Detection of slime production on Congo Red Agar: A. Black colonies of a slime-producing clinical S. epidermidis 519/12 strain. B. Red colonies of a non-slime producing clinical S. epidermidis 523/12 strain. The level of biofilm formation by S. epidermidis strains were tested using MTT-method. The absorbance levels (A554) were assumed by the authors in order to classify the analyzed clinical strains into 2 groups: high biofilm-producers (absorbance A554 ≥ 1.5; strains: 433/11, 439/11, 519/12, 526/12, 528/12, 531/12) and low biofilm-producers (absorbance A554 < 1.5; strains 430/11, 431/11, 432/11, 434/11, 517/12, 523/12). At the phenotypic evaluation of the ability of the strains for biofilm formation, correlation between the color of bacterial colony on Congo Red Agar and the level of biofilm production in MTT-test (the average of value absorbance) was observed. Six slime-positive on CRA medium strains (black or brown colonies) were high biofilm-producers, six slime-negative isolate (brick-red or pinkish-red colonies), were low biofilm producers. The tested ionophore antibiotics (salinomycin and monensin) were further studied for their ability to inhibit the formation of biofilms by clinical and standard S. epidermidis strains. The biofilm formation by most of the clinical S. epidermidis strains (9 of 12) was reduced in the range from 70% to above 90% by monensin and from 60% to above 90% by salinomycin in concentration 4 µg × ml-1 (2´ MIC for planktonic cells). The same concentration of reference antibacterial drug – ciprofloxacin, caused inhibition of biofilm formation in 60% by 5 clinical isolates. The graphs shows the effect of tested ionophores (salinomycin and monensin) and standard antimicrobial drug (ciprofloxacin) on biofilm formation by reference S. epidermidis ATCC 12228 and selected low-biofilm producing clinical S. epidermidis strains (Fig. 2-4). The standard deviation values were very low, is they are sometimes invisible in the figures. Fig. 2. Effect of the salinomycin on biofilm formation by standard and selected low-biofilm producing clinical S. epidermidis strains. All presented results are means from experiments performed in quadruplicate ± S.D. Fig. 3. Effect of monensin on biofilm formation by standard and selected low-biofilm producing clinical S. epidermidis strains. All presented results are means from experiments performed in quadruplicate ± S.D. Fig. 4. Effect of ciprofloxacin on biofilm formation by standard and selected low-biofilm producing clinical S. epidermidis strains. All presented results are means from experiments performed in quadruplicate ± S.D. The results revealed that monensin and salinomycin show high antibacterial activities against planktonic cells of methicillin-resistant S. epidermidis clinical strains, even higher than the activity of the reference antibacterial drug – ciprofloxacin. The values of the minimal inhibitory concentration of both ionophore substances ranged from 0.5 µg × ml-1 to 2.0 µg × ml-1, minimal bactericidal concentration values ranged from 4 µg × ml-1 to 16 µg × ml-1 (for monensin) and 4.0 µg × ml-1 to 32 µg × ml-1 (for salinomycin). The obtained results are in agreement with the literature data concerning antibacterial activity of ionophores against Gram-positive bacteria (Antoszczak et al., 2014; Łowicki et al., 2012; Łowicki et al., 2009). There was no previous data concerning the influence of the tested ionophore antibiotics, salinomycin and monensin on staphylococal biofilm formation. Charlebois et al. (2014) in their study showed the inhibitory effect of antibiotics and anticocccidials (i.e. monensin, narasin and salinomycin) on Clostridium perfringens biofilm formation. In this study both tested ionophores – monensin and salinomycin, exhibited high biofilm forming inhibitory activity against the clinical S. epidermidis strains, regardless of the level on which the biofilm was formed. The tested compounds showed potent antimicrobial activity when compared to standard drug – ciprofloxacin. In this study two ionophore antibiotics were examined against methicillin-resistant S. epidermidis strains isolated from blood samples. The results revealed that monensin and salinomycin show high antibacterial activities against planktonic cells of staphylococcal strains, even higher than the activity of the reference antibacterial drug – ciprofloxacin. In biofilm inhibitory test for most of S. epidermidis strains salinomycin and monensin at concentration 4 µg´ ml-1 inhibited the biofilm formation at above 70%. The presented study demonstrated that both tested ionophore antibiotics – monensin and salinomycin, possess significant antimicrobial activity against planktonic cells and showed a significant effect on biofilm formation by methicillin-resistant clinical S. epidermidis strains. Research subject carried out with the use of CePT infrastructure financed by the European Union – the European Regional Development Fund within the Operational Programme “Innovative economy for 2007-2013”. Antoszczak M., E. Maj, J. Stefańska, J. Wietrzyk, J. Janczak and B. Brzezinski. 2014: Synthesis, antiproliferative and antibacterial activity of new amides of salinomycin. Bioorg. Med. Chem. Lett. 24:1724-1729. Arciola CR., D. Campoccia, S. Gamberini, M.E. Donnati, V. Pirini, L. Visai, P. Spaziale and L. Montanaro. 2005. Antibiotic resistance in expolysaccharide-forming Staphylococcus epidermidis clinical isolated from orthopedic implant infections. Biomaterial. 26:6530–6535. Bridier A., R. Brandet, V. Thomas and F. Dubois-Brissonnet. 2011. Resistance of bacterial biofilms to desinfectants: a review. Biofouling. 27:1017-1032. Callaway T.R., T.S Edrington., J.L. Rychlik, K.J. Genovese, T.L. Poole, Y.S. Jung, K.M. Bischoff, R.C. Anderson and D.J. Nisbet. 2003. Ionophores: their use as ruminant growth promotants and impact on food safety. Curr. Issues Intest. Microbiol. 4:43-51. Charlebois A., M. Jacques and M. Archmbault. 2014. Biofilm formation of Clostridium perfringens and its exposure to low-dose antimicrobials. Front. Microbiol. 5:183. Christensen G.D, W.A. Simpson, A.L. Bisno, E.H. and Beachey. 1982. Adherence of slime-producing strains of Staphylococcus epidermidis to smooth surfaces. Infection and Immunity. 37:318–326. Clinical and Laboratory Standards Institute. 2012a. Methods for dilution antimicrobial susceptibility tests for bacteria that grow aerobically. Approved Standard M07-A9. CLSI CLSI, Wayne, Pennsylvania, USA. Clinical and Laboratory Standards Institute. 2012b. Performance standards for antimicrobial disk susceptibility tests. Approved Standard M07-A11. CLSI, Pennsylvania, USA. Clinical and Laboratory Standards Institute. 1999. Methods for determining bactericidal activity of antimicrobial agents. Approved Guideline M26-A. CLSI, Wayne, Pennsylvania, USA. Costerton J.W., P.S. Stewart and E.P. Greenberg. 1999. Bacterial biofilms: a common cause of persistent infections. Science. 284:1318-1322. Gomes F., P. Teixeira and R. Oliveira. 2014. Mini-review: Staphylococcus epidermidis as the most frequent cause of nosocomial infections: old and new fighting strategies. Biofouling. 30:131-141. Götz F. 2002. Staphylococcus and biofilms. Mol. Microbiol. 43:1367-137. Høiby N., T. Bjarnsholt, M. Givskov, S. Molin and O. Ciofu. 2010. Antibiotic resistance of bacterial biofilms. Int. J. Antimicrob. Agents. 35:322-332. Huczyński A. 2012: Salinomycyn – a new cancer drug candidate. Chem. Biol. Drug. Des. 79:235-238. Huczyński, A., J. Janczak, J. Stefańska, M. Antoszczak and B. Brzezinski. 2012. Synthesis and antimicrobial activity of amide derivatives of polyether antibiotic—salinomycin. Bioorg. Med. Chem. Lett. 22:4697-4702.
complexes with monovalent cations. Tetrahedron 65:7730-7740. Łowicki D., A. Huczyński, J. Stefańska and B. Brzezinski. 2010. Structural characterization and antibacterial activity against clinical isolates of Staphylococcus of N-phenylamide of monensin A and its 1:1 complexes with monovalent cations. Eur. J. Med. Chem. 45:4050-4057. Łowicki D. and A. Huczyński. 2013. Structure and antimicrobial properties of monensin A and its derivatives: summary of the achievements. BioMed. Res. Int. 2013: Article ID 742149. Mack D., H. Rohde, L.G. Harris, A.P. Davies, M.A. Horstkotte and J.K. Knobloch. 2006. Biofilm formation in medical device-related infection. Int. J. Artif. Organs. 29:343–359. S. Giannini and C.R. Arciola. 2011. Scenery of Staphylococcus implant infections in orthopedics. Future Microbiol. 6:1329-1349. Nagender P., G. Malla Reddy, R. Naresh Kuma, Y. Poornachandra, C. Ganesh Kumar and B. Narsaiah. 2014. Synthesis, cytotoxicity, antimicrobial and anti-biofilm activities of novel pyrazolo[3,4-b]pyridine and pyrimidine functionalized 1,2,3-triazole derivatives. Bioorg. Med. Chem. Lett. 24:2905-2908. Pascual A. 2002. Pathogenesis of catheter-related infection; lessons for new design. Clin. Microbiol. Infect. 8:256–264. Podbielska A., H. Gałkowska, E. Stelmach, G. Młynarczyk and W.L. Olszewski. 2010. Slime production by Staphylococcus aureus and Staphylococcus epidermidis strains isolates from patients with diabetic foot ulcers. Arch. Immunol. Ther. Exp. 58:321-324. Rutkowski J. and B. Brzezinski. 2013. Structures and properties of naturally occurring polyether antibiotics. BioMed. Res. Int. 2013: Article ID 162513.